ROHKUNSTBAU XXII takes up a statement made by Kofi Annan, the former General Secretary of the UN: “There is no trust more sacred than the one the world holds with children. There is no duty more important than ensuring that their rights are respected, that their welfare is protected, that their lives are free from fear and want and that they can grow up in peace.” The exhibition at Kulturschloss Roskow considers childhood as a special state of consciousness, as a fragile and endangered form of existence, and at the same time as an individual political right, as defined in the UN Convention on the Rights of the Child in 1989. The title Zwischen den Welten – Between the Worlds relates firstly, at a metaphorical level, to the transitional phase from childhood and youth to adulthood, a period of incubation which seems to be prolonged more and more these days as part of an “infantilisation of society”. Secondly, the title brings to mind, at a very concrete level, the journeying of refugees adrift “between worlds”, numerous children and teenagers among them. Setting off into the unknown often means an abrupt end to their childhood – or even their lives. 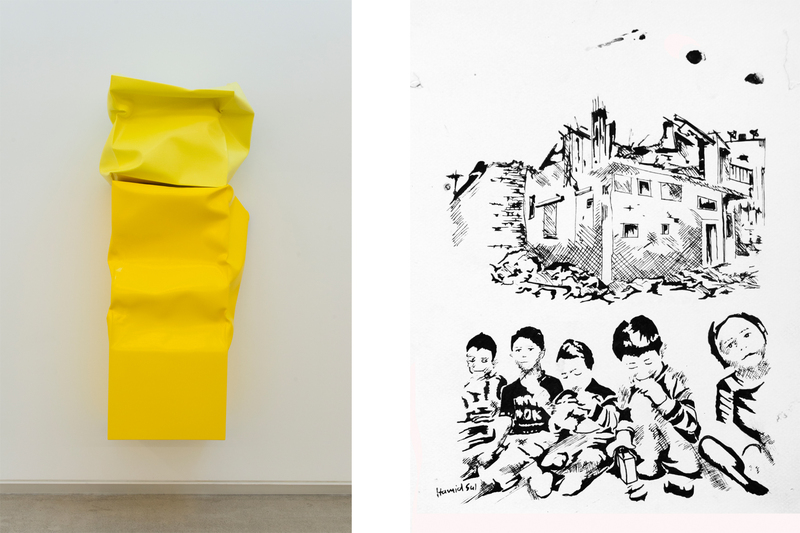 In Schloss Roskow, which served as a refugee camp for a while after World War II, eleven artists from various nations and continents – Europe, Asia, America – focus on the lifeworlds and emotional experiences of children in the twenty-first century. The artists mine their own childhood memories as the basis for paintings, drawings, sculptures, videos, and multimedia works revolving around fantasies and dreamscapes, around carefree play and “serious games”, around change, farewells, and rites of passage. Besides a number of newly discovered talents we encounter well-known names like the Spanish sculptor and object artist Angela de la Cruz, who was nominated for the Turner Prize in 2010, or the Syrian cartoonist Hamid Sulaiman, who made a name for himself as a chronicler of the Arab Spring. ROHKUNSTBAU XXII will also feature Mini-Shop by Chinese conceptual artist and calligrapher JIA, which is a touching reflection on the fate of “left-behind children”. An estimated sixty million children born to migrant workers in China grow up far apart from their parents, because the Hukou system, which has been in place since the 1950s, means that they are bound to their native provinces and can only go to school in their local area. JIA herself grew up with her grandparents. She experienced the mini-shops as a wondrous place “between the worlds” of school and home, where children could obtain sweets for next to nothing and the feeling of “being left behind” seemed to be blotted out for a few precious moments. The artist, who is now resident in Berlin, has opened one of these magical mini-shops at Schloss Roskow. For the children in Ammar al-Beik’s video La Dolce Siria the worlds of childhood and adulthood merge oppressively into one another: while children are busy playing with an old camera in someone’s front yard, the dull thud of bombs exploding can be heard in the background. While for the elderly Jewish women interviewed by Clemens Krauss for his video work Berliner Runde, little moments of delight still come to the fore when they think back on their childhood days, the shadows seemingly mislaid, forgotten, in deeper layers of the soul. The Cuban American artist Anthony Goicolea, who moves between the genres of photography, video, and drawing, uses narcissistic self-portraits to act out scenes from his childhood and adolescence with a mixture of humour and horror, while the colourful paintings of Ryan Mosley, Peter Stauss, and Edouard Baribeaud are peopled with ambivalent figures, and the fantastical creatures of Nigerian sculptor Sokari Douglas Camp seem to be located somewhere between shamanic rites of transformation and the popular worlds of film and gaming. For Potsdam artist Arne Schreiber the seaside holidays with his family on the Baltic coast that his parents recorded on Super 8 are only a fleeting memory. He further compounds the blurriness of these faded images of his childhood in East Germany with shimmering lines until they break up into optical noise, evoking associations not only of drowning but also of weightlessness. Since ROHKUNSTBAU was first established in 1994, it has been steadfastly supporting contemporary art and culture and reviving cultural sites in rural Brandenburg. The annual exhibitions bring together artists from around the globe for an exploration of topical and socially relevant themes. Previous editions of ROHKUNSTBAU have focused on issues such as Macht (Power, 2011), Moral (Morality, 2013), Revolution (2014), and Apokalypse (Apocalypse, 2015). Kulturschloss Roskow, has been hosting this international art exhibition since 2013.